Each week, Bob Gaughan looks back at the big events of the college football weekend. With UB not playing until Tuesday, he’ll also look ahead to their big game. UB starts their MAC-tion part of their schedule this week with a huge home contest vs Miami-Ohio. This game is for first place in the MAC East. The Bulls come into the game with the much better record. UB is 7-1 on the season and 4-0 in the MAC. Miami is only 3-5 on the season but they are 3-1 in the MAC. So a Miami victory would have both teams at 4-1 and the Redhawks with the tiebreaker. The Bulls are coming off arguably their most impressive performance of the season. 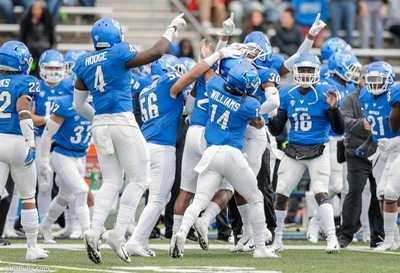 UB went into the Glass Bowl and dominated Toledo 31-17. The Bulls had 32 first downs to Toledo’s eight. Toledo was held to just 65 yards of offense in the second half. The UB defense has been on a roll recently. The Bulls for the first time since joining the MAC lead the conference in scoring defense and total defense. So much hype goes to the offense but the defense has been a huge reason for their 7-1 start. The Bulls defense will have to contend with Miami QB Gus Ragland. Ragland has thrown for over 1,700 yards this season and 14 touchdowns. Kick-off is set for 8pm at UB stadium. In the game known as the “worlds largest outdoor cocktail party”, the Georgia Bulldogs took advantage of three Florida turnovers to cruise to a 19-point win. Jake Fromm needed a good game for Georgia. Fromm threw three touchdown passes for the win. There had been speculation he could lose his job going into the contest. Georgia has a huge contest on tap next week against Kentucky. Bulldogs can clinch the SEC East with a win over a much-improved Kentucky team. This game was the coming out party for WSU QB Gardner Minshew. Minshew completed his first 19 passes of the second half to lead the Cougars to a come from behind win over Stanford. On the day he was 40 of 50 for 438 yards. The Cougars are now 7-1 on the season. WSU is the only one loss team in the PAC-12. *Clemson just handed Florida State their worst home loss in program history. Trevor Lawrence threw 4 TD passes in the 59-10 romp. *Michigan State bounces back after the horrible offensive performance against Michigan last week. Spartans new QB Rocky Lombardi (great name) led team to 426 yards of offense in a 23-13 win over a hot Purdue team. *Notre Dame’s toughest contest left might be next week in Northwestern. Wildcats have won four straight after beating number 20 Wisconsin 31-17. *Kudos to Kansas, who was written off after an opening night loss to Nicholls State. Jayhawks beat TCU 27-26. *Houston handed South Florida their first loss behind QB D’Eriq King. King accounted for 7 TD’s in the Cougars 57-36 win. *Syracuse QB Eric Dungey responded after being benched last week. Dungey threw for 411 yards in the Orange’s 51-41 win over NC State. *Bad Texas defense shows up as number 6 Longhorns fall in Oklahoma State 38-35. The loss means the race for the Big 12 title game is a mess. *Notre Dame dispatches Navy 44-22. Irish are in the final four if the can run the table. Their final four games are: at Northwestern, vs Florida State, vs Syracuse and at USC.